But it IS about hate sometimes. Hate, ignorance, and a preference for glaring misinformation that confirms already established biases over the truth. You can look at something like the van above, photographed in Oregon, and claim that this is just one insane person who isn’t representative of the views of most people who seem dedicated to blocking equal civil rights for some people, but from conversations I’ve had with many anti-gay rights folks, their position (politics aside) only really differs in the framing of the argument and specific speech used. More often than not, it seems to comes down to gays being sinful, being seduced by Satan into indulging their “sinful urges”, and they convince themselves that if we don’t recognize gays as deserving equal civil rights in society, that is somehow helping them and everyone else lead a better life. That, my friends, is both twisted and sad. And, no matter how gently this idea is presented, it is hateful. 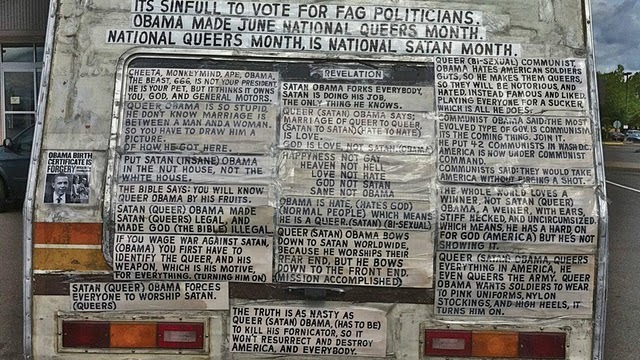 I have never met a gay person half as obsessed with all things gay as the people who claim to hate them the most. They remind me of the Odin Quincannon character from the Preacher comicbook series (ask Mike if you don’t know who I mean). I love national Satan month. It’s that time of the year when families get together to make god illegal and have a hard on for America. Someone really needs to rear-end this knucklehead. U mean him or just his car? The only reason there’s even a “gay controversy” in the first place is because RELIGIOUS people can’t just leave gay people alone and let them live their lives in peace. So don’t tell me how equal rights for gay people is somehow an “attack” against religion. Don’t tell me your churches and clergy need to be “protected” from the scourge of having to treat all human beings as equal. Don’t you dare.